Rosacea is a relapsing condition which often flares up and then goes through periods where it is less severe. The exact cause of the condition is actually unknown however, possible factors have been suggested which include abnormalities in the blood vessels of the face and a reaction to microscopic mites found on the face. There are also certain things that are known to trigger Rosacea. These include exposure to sunlight, stress, hot and cold weather, spicy foods, strenuous exercise, alcohol and caffeine. The main symptom that Rosacea causes is flushing and redness of the skin. However the condition can also cause burning and stinging sensations, spots and small blood vessels in the skin to become visible. 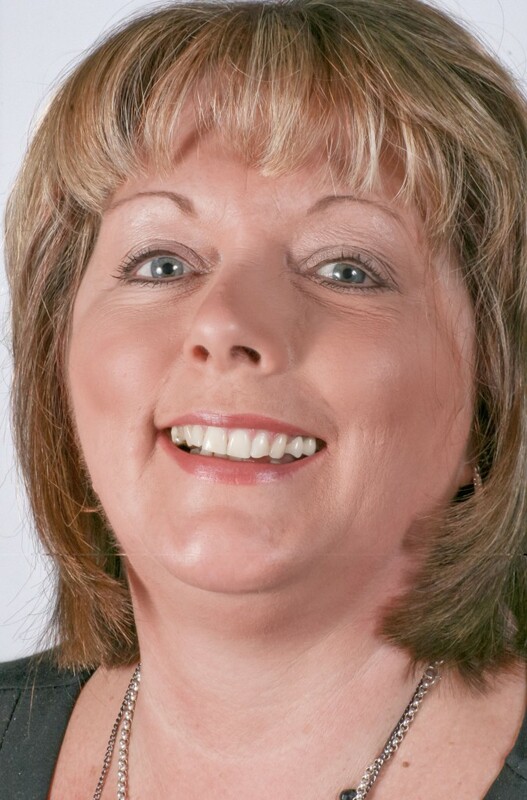 For more information on Rosacea check out the NHS site, the Rosacea Support Group and the National Rosacea Society. Vitiligo is the long term condition that causes pale white patches to develop on the skin due to the lack of Melanin, a pigment in the skin. It isn’t clear what causes the lack of Melanin however, the condition has been linked to problems with the immune system and nerve endings in the skin. Vitiligo can affect any area of the skin but it most commonly occurs on the areas of skin that are exposed to the sun. These include the face, neck and hands. The condition varies from person to person with some people getting a few small patches while others get big patches that eventually join together to form large areas of the skin. Theses patches are usually permanent. 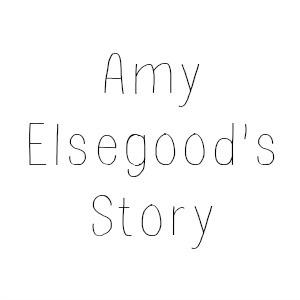 For more information on Vitiligo, check out the NHS site, the British Skin Foundation and the Vitiligo Society. Acne is a common skin condition. It causes spots to develop on the skin usually on the face, back and chest. The spots can range from surface blackheads and whiteheads which can be deep, inflamed, pus filled and even cyst like. Acne can also lead to scarring. The condition is most commonly linked to changes in the hormone levels during puberty however, it can start at any age. It affects the oil gland next to the hair follicles in the skin. Certain hormones can trigger these glands to produce more oily substance called Sebum. Sebum is an essential substance and is what lubricates the hair and skin however, when too much is produced the Sebum and dead skin cells build up in the hair follicles causing a soft plug and an environment where bacteria can thrive. Once the clogged pores become infected with bacteria, inflammation occurs. The blocked pore may then cause the follicle to bulge and produce a whitehead. When the whitehead is open to the surface it usually darkens causing a blackhead. Although this may appear to be dirt, the colour is actually caused by the white head reacting with the oxygen in the air. This is known as oxidizing. Underneath the blackhead the pore is congested with bacteria and oil. Blockages in the skin can also develop deep in the follicles, when this occurs cyst like lumps occur deep beneath the surface of the skin. There are also many myths about Acne and many people believe that eating greasy foods, having dirty skin and using cosmetics can cause the condition however, that is not the case although hormone changes, certain medications, diet and stress are known to worsen Acne. For more information on Acne, check out the NHS site and the British Skin Foundation. Birthmarks come in all different forms. They are coloured marks that are visible on the skin. Normally they are present at birth or develop soon afterwards. There are two main types of birthmark. Vascular, these are often red, pink or purple and are caused by abnormal blood vessels in/under the skin. There are also Pigmented Birthmarks, these are usually brown or tan in colour and are caused by a cluster of pigment cells. Examples of Vascular Birthmarks are Salmon Patch/Stork Mark, Infantile Haemangioma and Port Wine Stain. Examples of Pigmented Birthmarks include Cafe Au Lait Spots, Mongolian Spots and Congenital Melanocytic Naevi. The exact cause of birthmarks is not fully understood however, we do know that they are usually not inherited. Vascular birthmarks are caused by abnormal blood vessels in the skin whereas Pigmented birthmarks are caused by a cluster of pigment cells. For more information on Birthmarks, head over to the NHS site, the Birthmark Support Group and the Vascular Birthmarks Foundation. If you suffer from any of the above skin conditions and find you lack in confidence, Veil Cover Cream can help. Our full coverage camouflage product can hide, cover and conceal a whole host of things including all of the conditions above. 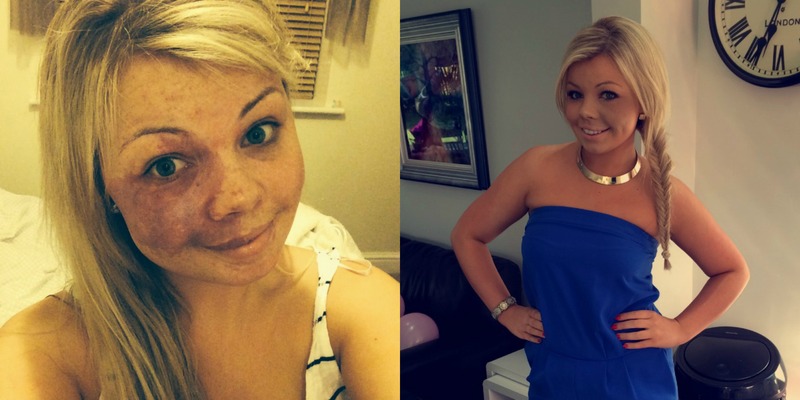 Skin Conditions can cause psychological effects to sufferers and although the use of our camouflage product cannot change the structure of the skin, it can immediately improve the visual effect which in turn can help regain self esteem making tasks like popping to the shops and engaging in social activities that little bit more bearable. 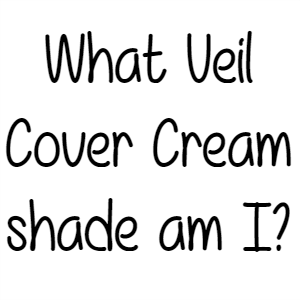 What Veil Cover Cream Shade Am I? 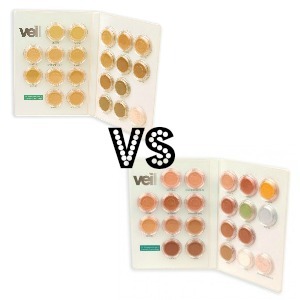 Many people often ask us the question “What Veil Cover Cream Shade Am I?” We do not like to recommend shades as our range is so large (we have over 40 different colours!) We unfortunately do not currently offer a skin colour shade matching service however, we do have three sample kits in our product range that are available to purchase. These come in the shades Light, Medium and Dark. Each kit contains twelve different shades of product and our two finishing powders in Translucent and Dusk to help set the camouflage cream. The idea of our kits is that you are able to test out our Cover Cream in the comfort of your own home and find a shade which matches your skin tone. To find your shade you simply pop a very small amount of cream onto the area that you wish to cover and blend into your skin. Once you find a shade that looks natural and you are happy with your results, you can then go on to purchase one of our full size Cover Cream jars with ease knowing that your shade choice will work for you. What Is The Difference Between The Original and The New Shade Veil Demonstration Kits? When it comes to our Demonstration Kits we find they are the ideal product for makeup artists, cosmetic enthusiasts and of course skin camouflage specialists as they are both compact in book style palette form and contain a whole variety of colours, ideal if you are working with various skin tones. We currently have two versions available to purchase, Original and New Shade. Many people aren’t too sure on which one to go for or what the difference is between the two so we thought we’d explain the difference. Firstly both kits come with twenty different Cover Cream shades. These are housed in what we call medallions and they come complete with screw off lids to ensure good hygiene and to keep the cream in tip top condition. As well as the camouflage product you also get a medallion of finishing powder to help you complete the look and increase wear time of the Cover Cream. The Original board contains our Translucent powder, ideal for all skin tones whereas the New Shade board contains our Dusk finishing powder. This powder has a slight tint to it, making it ideal for those with dark toned skin or those who have tanned. Our New shade contains the shades Cream, Wheat, Vanilla, Natural Light, Suede, Biscuit, Oyster, Almond, Honey, Sunglow, Beige, Caramel, Cinnamon, Latte, Oak, Hazelnut, Chestnut, Fudge, Coffee and Toffee. All the shades are flesh coloured ranging from light to dark. The Original board contains the shades Natural, Natural Medium, Dark, Suntan, Natural Tan, Peach, Tan, No. 3, Ebony, Umber, Medium, Rose, Yellow, No. 2, Green, Mauve, Brown, Mocha, Olive and White. These shades are a mixture of light to dark flesh colours and colour correcting shades which are designed to tackle things like redness, sallowness and blue undertones in the skin. When it comes to tattoos we think they’re great pieces of art work however, there may come a time in your life where you may want to cover and hide your ink. Some brides like to cover their tattoos for their big day whilst others may simply want to conceal their art for an occasion such as a job interview. 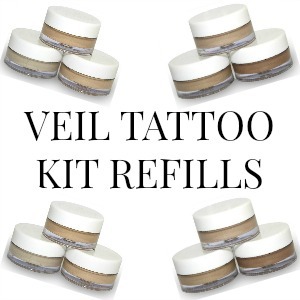 Whatever the case here at Veil we are here to help with our Tattoo Camouflage Kits. Our kits contains everything you need to prep your skin and conceal your tattoos including a 10g pot of finishing powder, a 30g jar of cleansing cream, a 30ml bottle of toning lotion, 2 spatulas, 4 cotton pads, a free powder brush and of course everything comes housed in a handy re-usable zip bag. Our tattoo kit should last you a long time however, there will probably come a time where you begin to run low on your products, but don’t worry, we have refills available to purchase! Our 3 Tattoo Camouflage Creams in Light/Medium retails at £10.00 as does our 3 Tattoo Camouflage Creams in Medium/Dark and our Tattoo Cleanser and Toner retails at £7.00. So if you ever run out of anything or you just want to add to your kit, check out our range! How Do I Remove Veil Cover Cream? 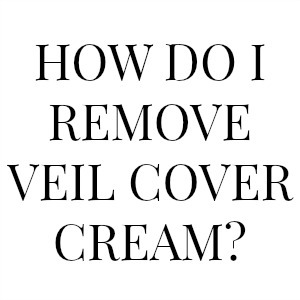 Here at Thomas Blake Cosmetics Creams Ltd we often get asked how to remove our Veil Cover Cream. Because our Cover Cream has such great lasting power, especially when our Finishing Powder is applied on top, our Skincare range is perfect for easy, fuss free removal. Check out our quick and easy guide below on how to remove your camouflage makeup. The first step to removing your Veil Cover Cream is to thoroughly cleanse the skin. To do this you should take a small amount of the Veil Cleansing Cream and apply to the skin in circular motions using your fingertips. Don’t forget to pay attention to those nooks and crannies of the face like the sides of your nose to ensure even distribution of the cleanser. Once you’ve applied the Cleansing Cream you now want to remove it with warm water. For this step you can use tools like sponges, muslin clothes and flannels but if you don’t have any of those, don’t worry, you can complete this step with your hands. Got sensitive skin? Don’t worry, our Cleansing Cream is unperfumed for allergy-free use and is gently on the skin. After you’ve removed your Cleansing Cream, take two cotton pads, pop some Toning Lotion on them and apply to the face and neck using circular movements. This step removes any remaining Cleansing Cream as well as remaining traces of oil and makes sure that the skin is nice and clean. It is also worth noting that our Toning Lotion combines the gentle astringent properties of Witch Hazel and Rose Water, this also gives it a fresh and delicate aroma. And voila! Once this step is complete you will be left with clean, makeup free skin. We recommend following out this routine every evening to ensure that your skin has time to breath when you head to bed. We also recommend repeating this routine when you wake up before you apply your Cover Cream to achieve the best possible application. 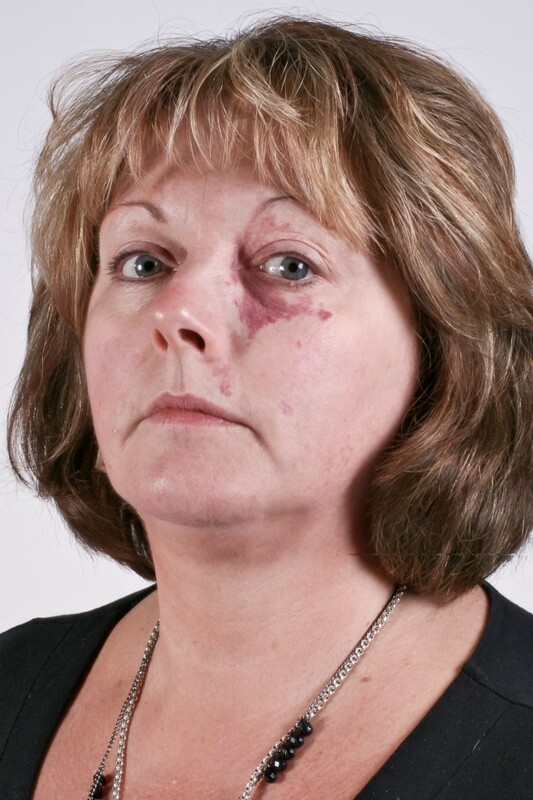 “When I was born in 1957 I had a large raised Port Wine stain on the left hand side of my face covering a large area around my eye, cheek and nose. After my Parents initial shock especially my Mum they set about trying to find the best treatment. My parents found a specialist in London (the best in Europe at the time) and it was from his consultation that they were put in touch with VEIL. They saw various Specialists in London and in the East Grinstead Famous Burns unit. I had a lot of various treatments as a child some of which I was too young to remember all were for the most part unsuccessful. Consequently I have been wearing Veil since a baby which is evident in all my baby photos. We have tried other product but always came back to Veil. My Childhood although happy was always tinged with bullying and a constant barrage of name calling and stares and whispers. As a young schoolgirl I wore Veil on the Port Wine side but not on the other applied by my Mum, this left me with being very pink on one side and white on the other, calls of “Coco the Clown “ were always the normal chant after PE and when I was hot in “Summer”. The worst incident I encountered was when a group of boys pinned me down in the playground and tried to scrub off my makeup to see what was underneath, It was an horrific experience which has stayed with me until well into Adulthood. It was about the age of 10 when I began to take responsibility for my makeup myself so used to spend hours in my bedroom with Veil and powder and blushers I became very adapt at covering my whole face with minimum on the “good” side and maximum coverage on the “bad” side. I have never looked back. I still got asked questions and I just shrugged my shoulders and casually said I have a Birthmark. Senior School brought other problems with confrontations with teachers because I had become so proficient at applying Veil and had mastered the art of blending with my normal makeup my birthmark was almost undetectable so the teacher thought I was flouting the no make up policy and despite several visits from my Dad and Drs letters nothing seemed to deter the teachers from picking on me. ”oh how times and attitudes have changed” . I was never short of boyfriends and I was a very confident Teenager , I got married young had children young and my Birthmark although a nuisance wasn’t much of a problem, my first Husband got used to it and it was only when our marriage failed he was very verbally abusive to my new partner about my birthmark well he already knew and was, and has always been very supportive to the point on insisting I go out with him without makeup ,which is still a real challenge he says I am more beautiful without makeup even now and we have been married for 30 years. I had extensive laser treatment in 1988 through to 2002 and although the results were initially good and the mark was more even and slightly faded , it has all come back and is even darker than before. I have used Veil after all the Laser procedures and continued to use it albeit a lesser amount throughout .I will not go through it again it was expensive and painful. I do not know what I would have done without Veil it has enabled me to live life to the full. Marry, have children , have a customer facing job . Photos are never a problem and unless I tell people no one ever guesses I have a birthmark. It has taken years to be comfortable in my skin , my motto is never look back only look forward. The ugly situations I encountered in my life have only made me stronger and the person I am today. 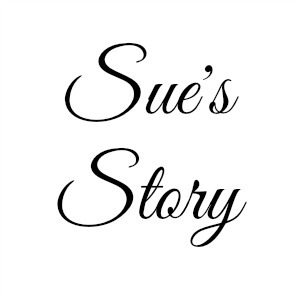 I have also helped many people :-Mums with babies with birthmarks, Brides hiding tattoos for there big day and guys needing to wear short sleeved shirts for corporate golf days where tattoos were not appropriate. All were so grateful for my help. “I was 7 years old when I first came to veil cover cream, for a camouflage colour match to cover the Port-wine stain birthmark that covered almost half my face. At that point I knew I was different to other children. Once I got my colour match, I only wore the make up if I was going to school discos or parties. When I started secondary school, I started wearing Veil more and more, until it came to the point where I didn’t like anyone seeing me without make up on. I tried other camouflage make up, but none of them were as natural, some took longer to apply and even longer to set. With Veil Cover Cream, I can apply in minutes, it provides full coverage and it will last me all day. Even going on holiday, once I apply veil in a morning I can get in and out the pool and be protected from the sun all day. Using veil cover cream has given me confidence, and gives me a natural look.